PowerShell is a “must-know” for Azure cloud development. Yes, it’s a scripting language, but moreover, it’s an automation engine that can execute complex tasks with minimal effort. The vast majority of Azure administrative functionality is available in PowerShell. Many of the GUI consoles are simply executing PowerShell commands behind the scene. 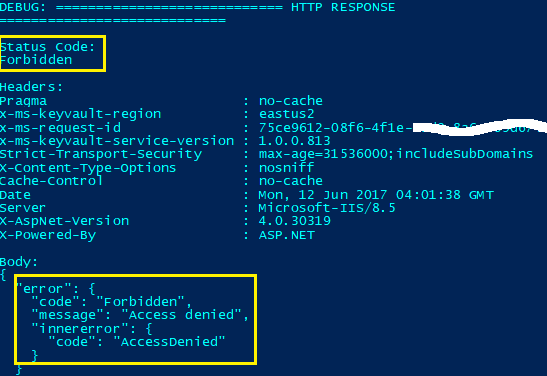 That said, what do you do when a PowerShell cmdlet presents a vague error message to you? 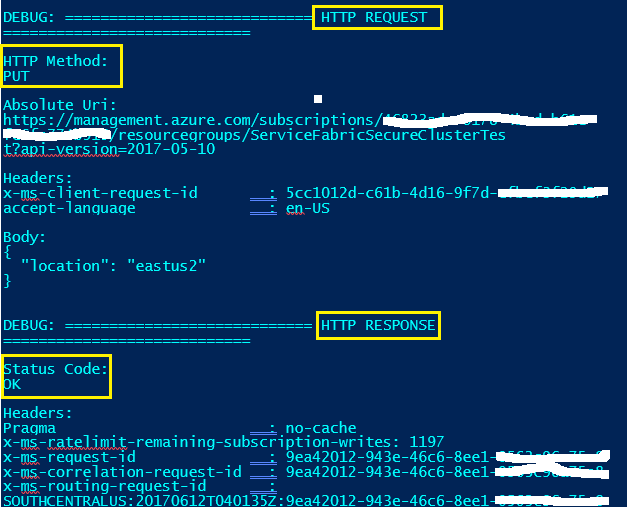 In the code block below, we invoke the New-AzureRMServiceFabricCluster to provision a secure Service Fabric cluster in an Azure Resource Group. If you look closely, it tells you that it is unhappy when executing the New-AzureRmServiceFabricCluster cmdlet, but provides little meaningful detail. The -Verbose parameter displays any and all logging entries included by the cmdlet author, such as “Connecting to xyz”. The -Debug parameter displays any trace code implemented with a Write-Debug statement in the cmdlet, such as dumping the content of a variable. Doing so exposes the logging and debugging statements added to cmdlet – which might just shed some light on the problem. Note above how the response returns a status code of Forbidden. Keep in mind that the Logging and Debugging information that you receive will be driven by the richness of the Write-Debug and Write-Verbose that the cmdlet author added, but it can be lifesaver in getting to the bottom of a vague error. ← What Do You Mean My Window Container isn’t Running?